As an English writer who reflected and highlighted the social issues of his time, Charles Dickens has no equal. He was a remarkably prolific man who, at times, could be found finishing one novel while starting another: the only solution to the continual pressure of monthly magazine publishing. Yet he was always acutely aware of the environment in which he lived. A period of great social change, the industrial revolution was ushering in new ways of living for the entire population. Rapid urbanisation, the harsh growth of factories, greater transit among the social classes which threatened to overturn established strata and politicise the new rich – these new brooms swept through society. At the same time, the changes raised many questions regarding existing institutions including the legal profession, poor relief, punishment and social justice. Dickens experienced the effect of all this first hand in many ways – through working in a blacking factory, through his family experience of debtors’ prisons and through his long walks in London seeing the harsh reality of mid-19th-century English metropolitan life for himself. It was his towering gift to be able to present all this not through a series of well-meaning tracts but through the novel – paradoxically an even more powerful medium. The remarkable series of 16 great novels, and Sketches by Boz, provides an unmatched picture of his time as he breathed life into the myriad issues of the Victorian era via his vast range of entertaining, sympathetic and frightening characters. In 1996, some 18 months after we started the Naxos AudioBooks range of classics, we issued our first Dickens: Great Expectations read by Anton Lesser. It won a ‘Talkie’ in the UK that year for the best classic. It was abridged, sold on cassette and CD, and was but the first of a series of Lesser/Dickens recordings. Lesser’s portrayal of the numerous characters and his sensitivity to the changing rhythms of Dickens’s writing won him thousands of followers throughout the world. Then, with the coming of the 21st century and the growth in digital downloads, we started to record the novels again – unabridged! Once again, we turned to Anton Lesser, who produced one endlessly inventive recording after another. You can hear him present six unabridged Dickens: A Christmas Carol (unabridged), Great Expectations (unabridged), Hard Times (unabridged), Little Dorrit (unabridged), The Old Curiosity Shop (unabridged) and A Tale of Two Cities (unabridged). Sean Barrett, another star reader, has recorded Barnaby Rudge, Martin Chuzzlewit and, with Teresa Gallagher, Bleak House. We were determined to ensure that all 16 of the principal novels were made available in unabridged form by the bicentenary, and so our readers have been busy in the studios. This month, to start this important year, we release two titles: David Horovitch reading Nicholas Nickleby in its entirety and OliverTwist: Retold for Younger Listeners read by Jonathan Keeble. We felt that this particular novel is well known through film and musical, but perhaps not so widely read by the younger generation. So Roy McMillan has gone back to the original novel, abridged it to make it less weighty for a younger audience but kept to the words of Dickens wherever possible, giving a real flavour of the writer himself. Ideal for 7–12 year olds. In February, we release David Copperfield, Dickens’s most autobiographical novel, read by Nicholas Boulton. In March comes Keeble’s unabridged recording of Oliver Twist, and in April comes David Timson’s recording of Dickens’s first (and most hilarious) novel, The Pickwick Papers. This follows his existing Dickens recordings: Our Mutual Friend and Dombey and Son; and he completes the Naxos AudioBooks cycle with The Mystery of Edwin Drood and Selections from Sketches by Boz in May. I hope that this careful matching of readers with novels will result in an exceptional collection of Dickens on audiobook, one that will prove an appropriate salute in the 200th anniversary of his birth, and one that will bring new admirers to his work. It is much easier, and initially more entertaining to watch a colourful, albeit abridged, dramatisation on television. 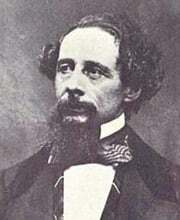 But as Dickens himself knew as he toured England giving readings of key passages from his books, packing halls and theatres up and down the country, perhaps the best way to encounter Mr Pickwick, Mr Micawber, Miss Havisham, Uriah Heep, Ebenezer Scrooge, Little Nell, Fagin, Bill Sikes, Sydney Carton and all the rest, is to listen and imagine!